Now you can add products to cart with the help of Ajax. Once a user clicks 'Add to cart' an Ajax message informing that a product was added to cart is shown. In addition, you will notice that the Shopping Cart block highlights and refreshes (in contrast to the earlier versions when the whole page was refreshed). This allows for much faster loading time. 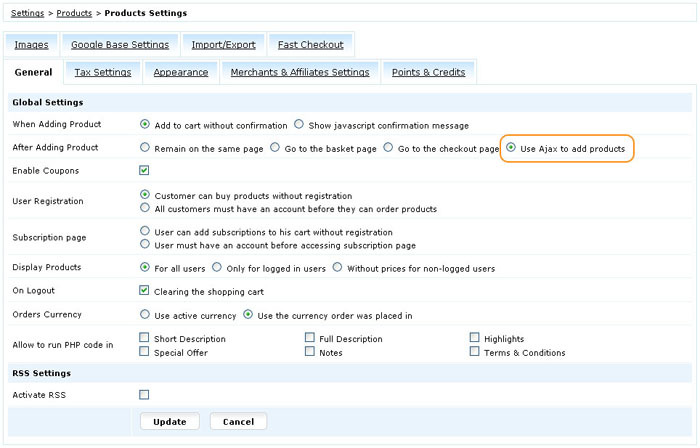 To activate this feature navigate to Settings > Products Settings and select the option 'Use Ajax to add products'. Note: You can modify the default AJAX message by changing the function "showPopupBlock" in the file "blocks.js" but you need to have some programming skills to do this.